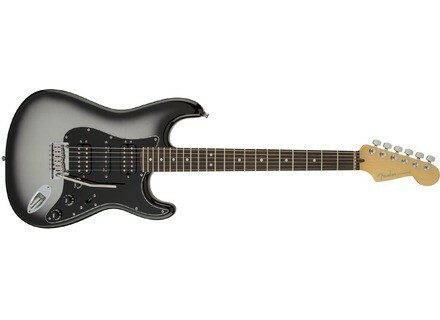 American Deluxe Stratocaster HSH, STC-Shaped Guitar from Fender in the American Deluxe Stratocaster series. Fender modifies the pickup setup on his American Deluxe Stratocaster electric guitar in this new HSH version. The Fender American Deluxe Stratocaster HSH is equipped with a Modern Twin Head humbucking pickup in bridge and neck positions, and a Noiseless N3 Single-Coil Strat middle pickup. The body of the guitar is made of alder, and it features a bolt-on maple neck with C shape, a rosewood fingerboard with compound radius (9.5" - 14"), 22 medium jumbo frets and pearloid Dot inlays. Nut width is 1.685" and the scale length is 25.5". The bridge is equipped with a 2-point synchronized Deluxe Tremolo with Pop-In Arm, locking tuners, a master volume, 2 tone knobs and a 5-way pickup selector. The Fender American Deluxe Stratocaster HSH is available in three finishes, 3-Tone Sunburst, Olympic Pearl and Silverburst, all with a 3-ply black pickguard. There are available now at authorized dealers for 1600€ approximately. More at www.fender.com. Kompozit Guitars, polyester guitars made in France The guitars of the XXI Century come from the western part of France, where Kompozit Guitars manufactures instruments from glass fiber. Free Digitech e-pedals for the iStomp Digitech thank their custom after the technical issues they faced in the last few months with free e-pedals for the iStomp. New Strymon BigSky reverb pedal Strymon is about to launch a new digital reverb pedal for guitar, called BigSky.